MALELANE, South Africa – Charl Schwartzel eased to a four-shot victory at the Alfred Dunhill Championship on Sunday to become the third South African behind Ernie Els and Retief Goosen to win 10 European Tour titles. Schwartzel’s fourth triumph at the Alfred Dunhill was ultimately comfortable as he finished with a 2-under 70 for a 15-under total of 273. The 2011 U.S. Masters champion also claimed a small piece of history for himself by becoming the first South African to win a European Tour event four times. Schwartzel won ahead of a group of Frenchmen who chased him on the final day at Leopard Creek Country Club. Gregory Bourdy was second on 11 under, Benjamin Hebert was third on 10 under, and rookie Sebastien Gros finished fourth on 9 under. Schwartzel’s lead was cut to one shot around the turn, but he picked up birdies on Nos. 11, 13 and 14 to pull away again and a routine par on the last capped another victory at his favorite event. The 31-year-old from Johannesburg reacted to his first European Tour win in two years by raising his arms and puffing out his cheeks in a display that showed his relief at finally getting a victory. Schwartzel was sprayed with champagne by fellow South African players Louis Oosthuizen and Hennie Otto as he walked off the 18th green, smiling again. 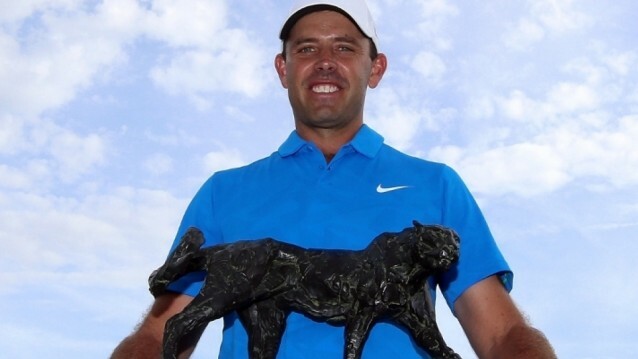 Seven of Schwartzel’s 10 tour titles have come in South Africa, and the Leopard Creek course is undoubtedly his best with four second-place finishes at the Alfred Dunhill Championship to go with his four victories. “I wish we could play some majors here,” he said. Although Schwartzel struggled at times this week, none of his chasers could take advantage and mount a consistent challenge. Hebert was a shot off the lead at the turn but he couldn’t pick up any more shots after No. 11. Bourdy did well to recover for second after a 6 on the short, par-3 No. 7. Rookie Gros, who was playing in just his second European Tour event, had back-to-back double bogeys early in his round. Playing in the final pair alongside Schwartzel, the 26-year-old Frenchman shrugged off those early problems and birdied the last for his best performance to date.